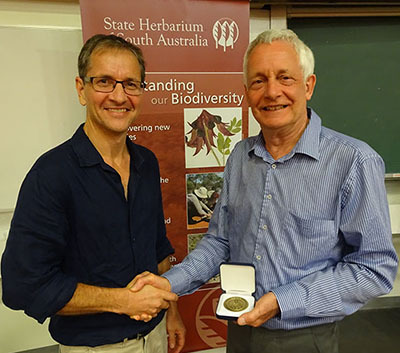 Last week, the joint meeting of the Australasian Systematic Botany Society (ASBS) and the Society of Australian Systematic Biologists (SASB), including the biennial Invertebrate Biodiversity and Conservation Meeting, was held in Adelaide. 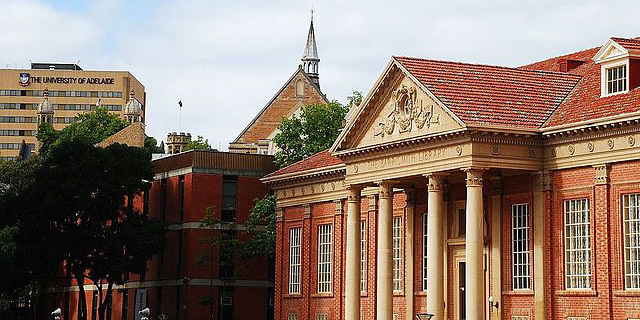 About 160 delegates, botanists and zoologists, met at The University of Adelaide to hear about and discuss the latest research and developments in systematics and taxonomy. ASBS President Darren Crayn congratulating Burbidge Medallist Pat Brownsey. Photo: J. Clarkson. The launch of the new Australian eFlora by Prof. Bob Hill (Environment Institute, The University of Adelaide), replacing the Flora of Australia book series, coordinated by the Australian Biological Resources Study (ABRS). Presentations by research students and professional botanists and zoologists were excellent and provided an insight into the latest research in systematics in Australia and New Zealand, as well as the application of new techniques and methods. The Conference Book with abstracts to all presentations is available online (5.1mb PDF). The Organising Committee included staff members and post-graduate students from the State Herbarium of South Australia, The University of Adelaide, the South Australian Museum and Flinders University. The next ASBS Conference will be held at the Queensland Herbarium in Brisbane in Dec. 2018. The University of Adelaide, Barr Smith Library in the foreground. Photo: M. Seyfang (CC-BY). This entry was posted in News on 6 December, 2017 by Jürgen.